By AGENCE FRANCE PRESSE, BRATISLAVA, Slovakia, Sept 23 – European trade ministers scrambled Friday to salvage talks on a massive free trade deal with the US amid angry calls that Europe abandon negotiations. Ministers from the EU’s 28 member states meeting in Bratislava are attempting to patch over deep differences after tens of thousands of demonstrators thronged European cities demanding the EU walk away from the US accord. “From our point of view, the talks are effectively suspended, because meaningful negotiations are no longer taking place,” said Reinhold Mitterlehner, the economy minister from Austria, where opposition to the deal is fierce. “It would be wise to put on mute something that is perceived so negatively,” he added, confirming a position Austria shares with France, the EU’s third biggest economy. The ambitious Transatlantic Trade and Investment Partnership (or TTIP) as the free trade deal between the European Union and United States is known would create the world’s biggest market of 850 million consumers stretching from Hawaii to Lithuania. But defending free trade deals has become increasingly fraught for leaders, with the rise of populists such as US presidential candidate Donald Trump blaming globalisation for stolen jobs and falling wages. 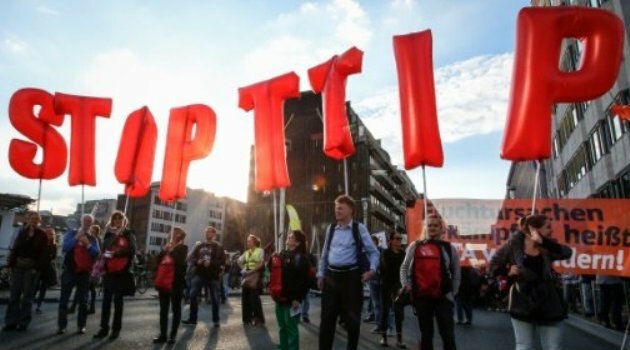 TTIP, under negotiation since 2013, has become a hot potato as key elections approach in the United States, France and Germany, with the goal of sealing the agreement by the end of the Obama administration all but abandoned. There are deep-seated fears in Europe that the deal would undercut the 28-nation bloc’s standards in key areas such as health and welfare. “Negotiations are continuing,” said Cecilia Malmstroem, the EU commissioner for trade who is leading the talks with the US. “It is true that they are difficult and there is still a lot remaining so the likelihood of a quick solution is becoming smaller and smaller,” she said. France and other critics complain that the US side has failed to offer anything “serious,” especially on sensitive issues such as protecting geographical labelling for renowned farm products, including Champagne or Roquefort cheese. In Germany, TTIP has split the ruling coalition, with Chancellor Angela Merkel still the treaty’s biggest backer in Europe but her socialist partners, led by Vice-Chancellor Sigmar Gabriel, dead set against it. Hopes remain for CETA, however, the deal with Canada that has already been negotiated, but it has had to overcome unexpected hurdles in Germany, where Gabriel’s socialists put up last minute resistance. But fears of a failure of CETA have waned since German socialists narrowly backed the deal at a party conference last week. “The Americans were not prepared to make proposals like the Canadians,” said Gabriel as arrived for the talks in Bratislava. Last-minute opposition has flared up in Austria and Belgium, but ministers backing the deal hope to greenlight the treaty so that it can be signed with Canadian Premier Justin Trudeau at an EU-Canada summit on October 27. CETA would then go on for ratification in national and regional parliaments across the EU, a tricky and likely time consuming process. But opponents believe CETA is an attempt to set a dangerous precedent before completing the much bigger accord with the US. More than 160,000 demonstrators thronged seven major cities across Germany on Saturday. Thousands more protested outside EU headquarters in Brussels on Tuesday.